Calcium Fluoride is often used in spectroscopic windows and lenses due to its high transmission from 350nm to 7µm. Calcium Fluoride is also commonly found in cryogenically cooled thermal imaging systems. Its low absorption and high damage threshold makes it a popular choice for excimer laser optics. 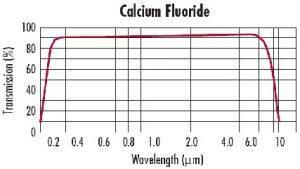 Calcium Fluoride’s low refractive index allows it to be used without an antireflective coating. The Knoop hardness of Calcium Fluoride is 158.3.